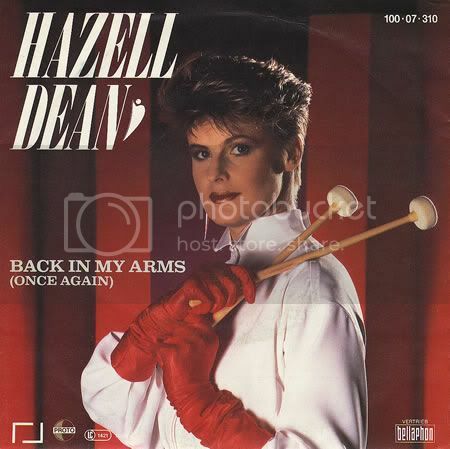 hazell dean is a rare creature with a magnificent gelled spiky cockatoo look sprouting from her head. her "live" performance of 'whatever i do wherever i go' takes place in a european vision of an american truck stop, complete with an unnecessary fatty wearing suspenders and chowing down on a sandwich. WEIRD! 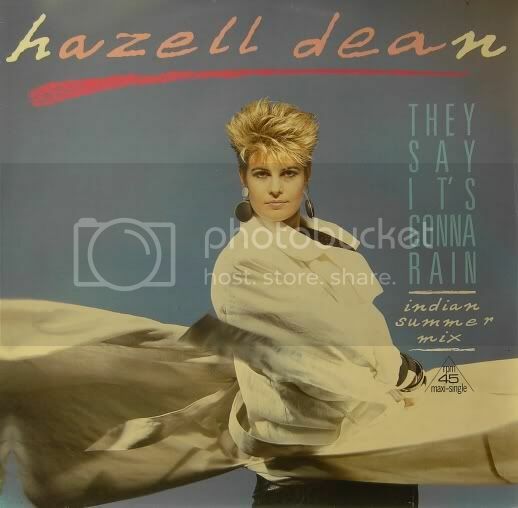 the video for 'they say it's gonna rain' has a classy WWW.HAZELLDEAN.NET logo on the bottom the entire time. loving the narrative of this video, closeup cockatoo shots, great clips of hazell getting her bags off of the luggage carousel, and her caressing her male friend on the beach. amazing video. 'who's leaving who' starts off looking like hazell is trying to look a bit too happy and a bit too bouncy and unnatural. then she gets a bit more serious but just as bouncy and unnatural. oh hazell. how could you not love her.